Lost Children Arc, The Black Swordsman Ver. 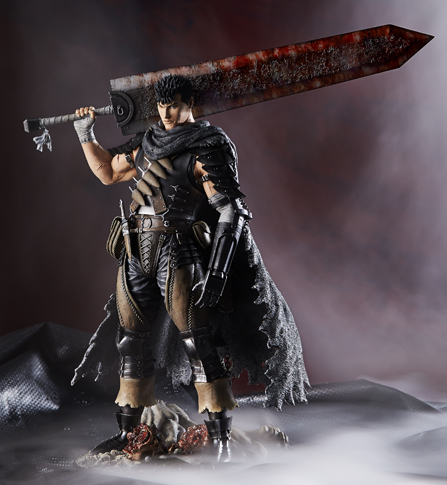 The Black Swordsman "Guts" is recreated as a huge 1/6 scale figure. The powerful stance captures the attitude of the character, his giant sword “Dragonslayer” resting on his shoulder. His freshly used sword, along with the slain bodies on the base below, create a tense atmosphere. There are 2 heads included, capturing both "glaring" and "sneering" portraits. "The Brand of Sacrifice" is carved into the back of his neck. All the textures of the gadgets are sculpted in exacting detail. Details as subtle as the hidden crossbow in the mantle were sculpted with the greatest of care, making no compromises. pouch helps express the world of Berserk. ●D4TOYS (Other countries) click here! !